Old Boots and Flying Sandals. NOTE: if you do not wish to use Paypal you may purchase this CD by sending a EURO cheque to OaC, Spanish Point Rd., Miltown Malbay, Co. Clare, Ireland. Your CD will be dispatched as soon as the funds have been cleared through our Bank account. 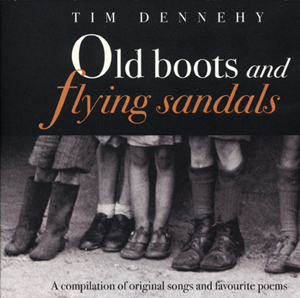 Tim Dennehy was born in Ballinskelligs and later the family moved to nearby Cahersiveen on the Iveragh peninsula. Both his parents sang any were inheritors of a huge store of songs and stories in the Irish language. Tim's mother, Nora Kelly came from Cill Rialaig and her father Pádraig (1868-1948) is one of the oldest recorded voices of the peninsula. Leave the old boots aside for a while then and allow the intensity and passion, the gentleness and love take flight through the lyrics and music of these songs composed and sung by "one of the finest traditional singer- songwriters of the present time"
Format: Single CD with booklet.